Sharks are the ultimate predator and are a lot of fun to catch using light-heavy tackle. Here in Myrtle Beach, we have a large population of Sharks and anglers usually do not have to wait long before the rod bends and the drag starts screaming. There are several species of sharks you can catch in Myrtle Beach: Atlantic Sharp nosed Sharks, Bonnethead Sharks, Bull Sharks, Lemon Sharks, Black tip Sharks, Hammerhead Sharks, Tiger Sharks, and Nurse Sharks… just to name the more popular species. While targeting sharks, we also catch Red Drum, Tarpon, Bluefish, Stingrays, Cobia, and more. Here in Myrtle Beach, shark fishing charters are mostly done in the protected waters of the inlets and at the Jetties with the fishing grounds just a few minutes from the pickup point. While out on your trip you will see many of the historic sites and natural beauty of the South Carolina Lowcountry. 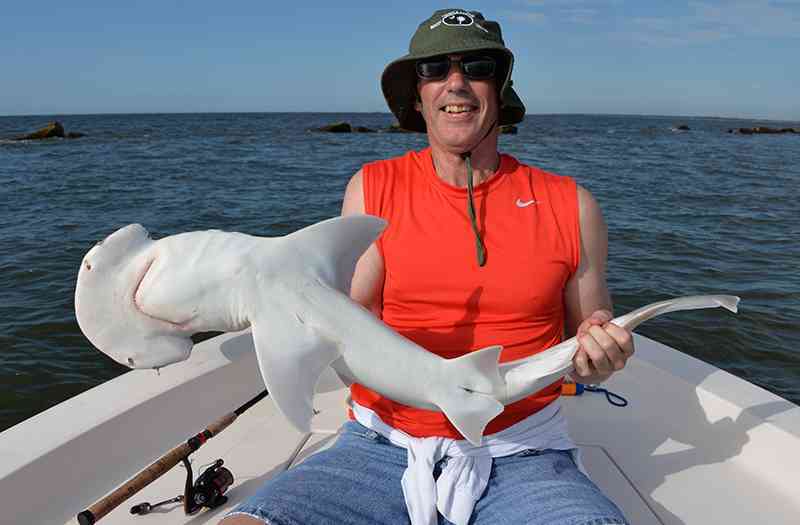 Shark fishing in Myrtle Beach is best in the warmer months when plenty of baitfish is available. We begin to see shark activity beginning in May will fish for sharks thru October. Captain Jordan Pate caters to anglers of all skill levels so virtually no experience is needed for shark fishing in Myrtle Beach, however please be advised that some sharks we catch often push the 200lb mark so be prepared to do battle with a fish of a lifetime. Shark fishing charters are great fun for the entire family and especially the kids. While some species of sharks are available for consumption here in Myrtle Beach, we take great pride in our natural resources and sharks are a vital part of our eco-system, therefore all sharks are catch and release only. Ensuring that there will be plenty of fish for the next generation to enjoy is our policy on sharks.